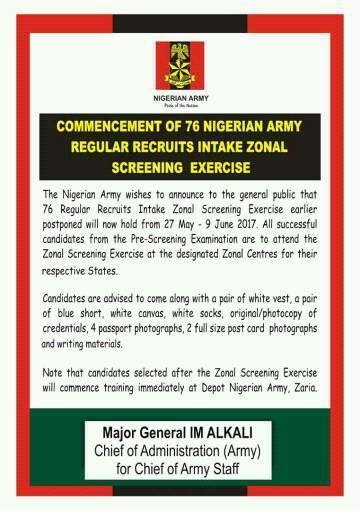 The Nigerian Army wishes to inform the general public that 76 Regular Recruits Intake Zonal Screening Exercise earlier postponed will now hold from 27 May to 9th June 2017. 0.1 All successful candidates from the Pre-Screening Examination are attend the Zonal Screening Exercise at the designated Zonal Centres for the, respective States. All successful candidates from the Pre-Screening Examination are attend the Zonal Screening Exercise at the designated Zonal Centres for the, respective States. Candidates are advised to come along with a pair of white vest, a pair of blue short, white canvas, white socks, original/photocopy of credentials, 4 passport photographs, 2 full size post card photographs and writing materials. 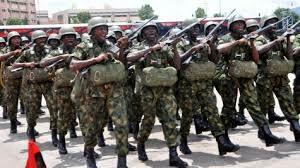 Note that candidates selected after the Zonal Screening Exercise will commence training immediately at Depot Nigerian Army, Zaria.